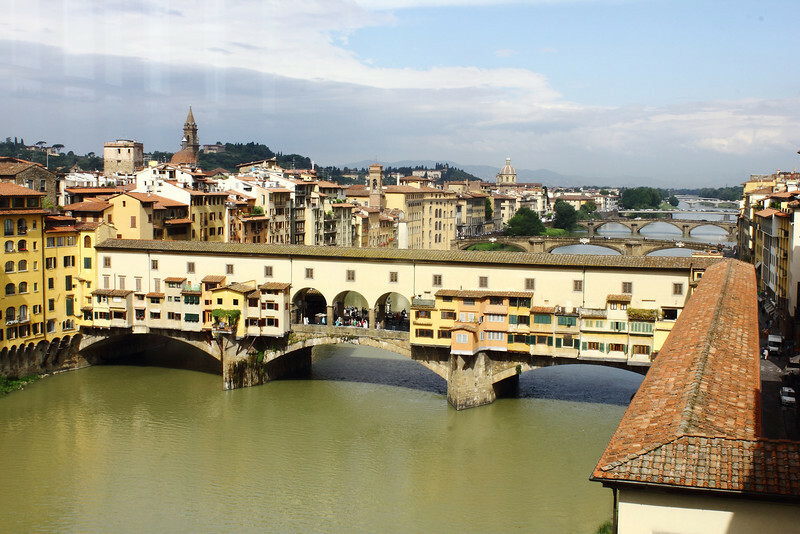 Ponte Vecchio bridge, Florence. From Wikipedia: The bridge spans the Arno at its narrowest point where it is believed that a bridge was first built in Roman times. The bridge first appears in a document of 996. In order to connect the Palazzo Vecchio (Florence's town hall) with the Palazzo Pitti, in 1565 Cosimo I de' Medici had Giorgio Vasari build the Vasari Corridor above it. To enforce the prestige of the bridge, in 1593 the Medici Grand Dukes prohibited butchers from selling there; their place was immediately taken by several gold merchants.